A disease of the microcirculation of the foot -- in other words, the foot doesn't get enough blood-- founder doesn't just occur. It is the result of several complex processes. Founder is frequently the cause of lameness in ponies. Road founder -- trotting a barefoot horse a long way on pavement -- is one of the few direct causes of the ailment. "As a result of one disease or illness, endotoxins develop, and circulation to the feet is compromised," explains Ted Vlahos, D.V.M. "This means there's a reduced supply of oxygen going to the foot, which, in turn, causes the hoof's sensitive lamina to die. "The lamina connects to the coffin bone and to the hoof wall. When enough lamina die, there's nothing holding the coffin bone in place, and it rotates, or in worst-case scenarios, comes through the sole of the hoof." Ponies and spring grass too often mean problems with founder. Why? "Ponies tend to be predisposed to obesity," the Sheridan, Wyo., vet, says. "Sure, some are obese due to overeating, but some ponies may have hypothyroidism, a problem that affects metabolism. This causes blood circulation problems, which, in turn, cause founder." Vlahos notes that ponies often experience hyperlipemia, a disorder of fat metabolism in the liver. This causes a significant increase in the number of triglycerides and dangerous lipoproteins, which, in turn, reduce blood flow to the hoof. Dysfunction of the pituitary gland, sometimes caused by tumors, can also lead to founder. "A pituitary gland dysfunction makes the body produce too much cortisone, which shuts off blood flow to the feet," Vlahos says. Managing your pony's eating can reduce the incidence of green grass founder in the spring. "At the beginning of spring, the urge is to throw open the barn door and let your pony or horse spend all day enjoying the lush grass," says Vlahos. Too much fresh grass produces acid in the gut, which causes the pH to drop. The good bacteria in the gut die and release toxins, which, through a cascade of events, restricts blood flow to the hoof. The result, Vlahos explains, is often founder. "Remember that horses' dietary changes should always be made gradually. 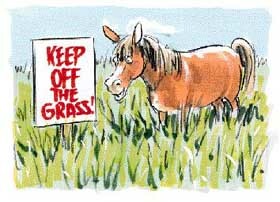 When grass becomes green and lush, limit the pony's grazing time," the vet cautions. "Leave him out the first day for only a half hour, the next day for an hour and so forth until his system has developed the right type of bacteria in the gut. A couple of weeks is not unreasonable." It's not just spring grass that can cause a founder -- any dramatic diet change may cause it. Prevention is the key. Vlahos strongly recommends an annual veterinary exam for your pony, which can reveal early signs of pituitary, thyroid and liver dysfunction. "If your pony founders, call your vet immediately and do not exercise the horse until he has been examined," Vlahos says. "Your vet will try to enhance the blood circulation in the foot using drugs; cold hydrotherapy; support of the hoof and frog; and medication to break the pain cycle." Read the next horse shoes article on White line disease.